Music Gettysburg presents music for voice and piano with Soprano Annie Gill, Tenor Joseph Regan, Baritone Jason Thoms and pianist Andrew Stewart Garth Baxter's Four Views of Love, Is this the cost? (from Lily), Nights without sleep, A wife in London, Two Last Songs and I have said I love you/I dare not dream (from Lily) will be performed. There will be a number of songs by Hollis Thoms as well as several operatic duets from Carmen and Candide. Garth Baxter's Rusticola for solo guitar will be performed by Mark Edwards as well as his work When Lights Begin to Show for flute, clarinet and guitar. This is part of the Baltimore Composers Forum spring concert. Soprano Annie Gill and pianist Andrew Stewart performed Two Last Songs and Is this the Cost? Saxophonist Kenny Baik and pianist Bonghee Lee played Garth's piece Des Larmes Encadrées in concert December 12, 2018 at Shandong University of Art in Jinan, China. Saxophonist Kenny Baik and pianist Bonghee Lee performed Des Larmes Encadrées as part of the Baltimore Composers Forum Fall recital. Soprano, Angela Presutti Korbitz and guitarist Ron Korbitz performed Garth's work Two Remembrances (August and Gone with the wind--Columbia Music) on a concert entitled: "Troubadours and Vagabonds"
Garth's piece Il y a longtemps for violin and piano was premiered by violinist Heather Haughn and pianist Jay DeWire. The concert was presented by the Baltimore Composers Forum. Tickets are $15/10 at the door. Three Poems from Edna St. Vincent Millay were performed by soprano Annie Gill and pianist Timothy McReynolds as part of the 25th Anniversary concert for the Baltimore Composers Forum. Let's End With a Waltz for Brass Quintet will be played Sunday, November 5, 2017 at 3 pm on the concert "Brass in Baker" by the McDaniel Faculty Brass Quintet at Baker Chapel on the campus of McDaniel College. This concert is part of the Chamber Music on the Hill series. 701 S. Charles Street, Baltimore, MD. Sunday, December 4 at 7pm. MELLIFLUOUS SINGLE REED SOUNDS FOR CLARINET AND SAXOPHONE. The performers were Saxophonist Dave Duree and pianist Rachel Andrews. Garth Baxter's The Four Songs from Twelfth Night was performed as part of a concert at St. John's College in Annapolis, MD. It was part of a concert commemorating the 400th anniversary of Shakespeare's death. The main portion of the concert was a presentation of "O, know, sweet love, I only write of you" an opera for soprano, baritone and string quartet based on selected Shakespeare sonnets by Hollis Thoms. Garth Baxter's Let's End With a Waltz (for brass quintet) received its premier at the Baltimore Composers Forum concert Autumn Brass. This work was written for the Lyric Brass Quintet who were the performing artists for this concert. Admission is $15 ($10 students), cash only at the door. Des Larmes Encadrées was performed by Jeremy Koch, Saxophone and Andrew Stewart, Piano. And Death Shall Have No Dominion was performed by the Owensboro Community and Technical College Chorus, and the Kentucky Youth Chorale under the direction of Dr. Constance Ford. The Songs of Life were performed by the Kentucky Youth Chorale directed by Julie White. Self Portrait at 44, Marks, The Long Hill, Is this the cost? and Grandmother, think not I forget were performed by Soprano Katherine Keem and pianist Andrew Stewart at the OperaBelle recital at Edenwald. The Atlantic Guitar Quartet played To Aegir and Shenandoah: A Fantasy. Katherine Keem and Kathrin Murray played selections from the CD Katherine Keem Sings Songs and Arias by Garth Baxter. Soprano Katherine Keem and Pianist Andrew Stewart gave the world premier of: Is this the cost? The penalty I pay? from Act II, Scene II of Lily. This is part of the series "Happenings at the Harman". Nicholus Currie and Diana Greene played Could You Dream What I Dream for violin and piano. 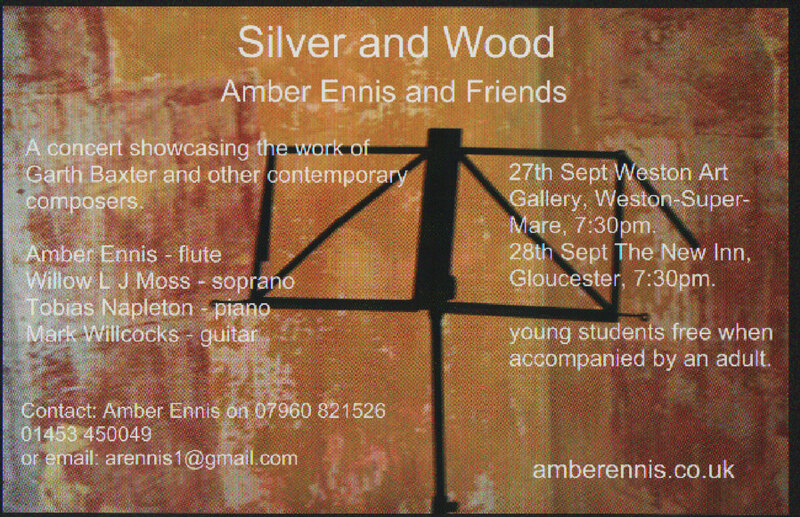 The Silver Run and Variations on the Willow Tree was performed by flutist Amber Rose Ennis. Ms. Ennis was accompanied by pianist Tobias Napleton who also played solo piano music including Mr. Baxter's Romance without words. In addition vocalist Willow L. J. Moss sang The Four Songs from Twelfth Night by Mr. Baxter accompanied by guitarist Matt Willcocks. Katherine Keem and Kathrin Murray performed a number of Mr. Baxter's songs for voice and guitar from their upcoming CD, Katherine Keem Sings Songs and Arias by Garth Baxter. Grandmother, Think Not I Forget and A Wife in London was performed by Soprano Katherine Keem and pianist Andrew Stewart at the Opera Belle concert. Garth was privileged to be asked to work with Amit Kumar on the music for the film Hardwater which was premiered at the Maine International Film Festival on July 21st and 22nd. The Battle from The Battle Cry: A tragedy was performed by the Masterworks Chorale of Carroll County at the World Choir Games. Drummer Hodge from The Battle Cry: A tragedy was performed by the Masterworks Chorale of Carroll County at the World Choir Games. The Battle from The Battle Cry: A tragedy was performed by the Masterworks Chorale of Carroll County as part of the World Choir Games. Masterworks Chorale of Carroll County performed Garth Baxter's cantata The Battle Cry: A Tragedy. Could You Dream What I Dream (for Violin and Piano) received its world premier by Nicholas Currie and Diana Greene; and pianist Ruth Rose played Resistance and Romance Without Words. Garth Baxter's song cycle Two Songs of Reflection was performed by Katherine Keem and Andrew Stewart. Garth Baxter's piano work Resistance was danced to by Effervescent Collective. Baritone Jason Buckwalter and Pianist Andrew Stewart performed Garth Baxter's Romance Without Words for solo piano and selected art songs. The Ross-Burgess Flute and Piano duo played The Silver Run. Elitza Harbova gave the world premier performance of A Romance Without Words.